All incoming Pilates students must go through an Initial assessment before entering class. If there is no or little Pilates experience, then private lessons must be taken before entering the classes. 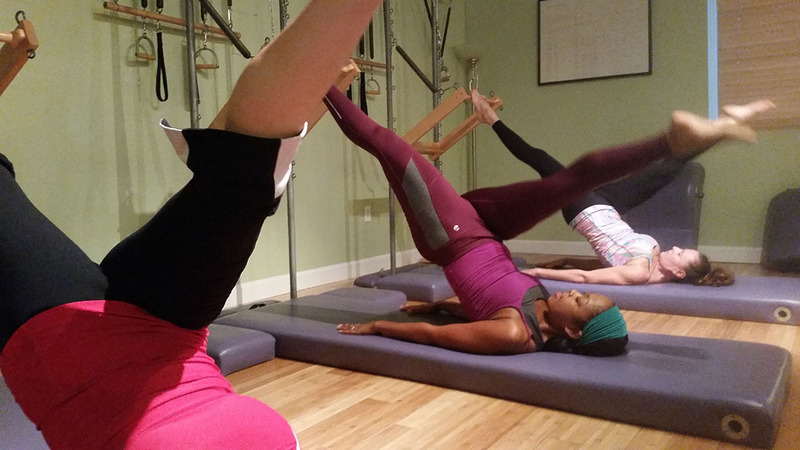 These classes include the system of the Mat, Reformer and extras chosen from a variety of apparatus such as the Tower, Barrel, Spine Corrector, Magic circle, Standing Arm Weight Series, and The Wall. There are over 600 exercises to choose from in the classical work. Each class is different and catered to the participants in class. Each private lesson is catered to the individual clients needs. The client has the opportunity to move around the studio and work on a variety of apparatus that are not available during classes. Private lessons are where the client gets detailed, specialized, individualized attention to their specific needs. This hour two people work side by side using reformer, mat, springs, barrels, magic circle and hand weights. Great for friends and couples. Our unique 10 week program give our participants amazing goal-oriented results and transform not just their bodies but their life style! We host an array of incredible events every season announced via our twitter feed @PilatesParadise, facebook page /Pilates in paradise and found online in our “Upcoming Events” section. Pilates is a method of exercise and physical movement designed to stretch, strengthen, and balance the body. These exercises concurrently involve one’s body and mind to the purpose of improving posture, restoring muscular tone and correcting muscular imbalance. Classical or True Pilates refers to the method of Pilates taught that most closely resembles what Joseph Pilates taught himself more than 80 years ago. Pilates in Paradise teaches the True Pilates Method as handed down from Joseph and his wife, Clara to Pilates protege, Romana Kryzanowska. 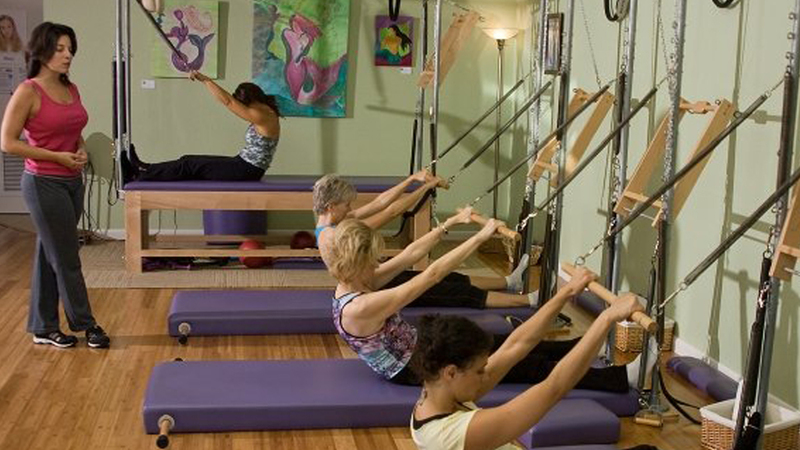 All instructors at Pilates in Paradise have been trained through world renowned Romana’s Pilates. ALL Romana’s Pilates instructor trainers are handpicked, guided and directly mentored by Level I Instructors’ Romana Kryzanowska, Sari Mejia Santo and Juanita Lopez. Such individuals were selected to participate solely on Romana, Sari or Juanita’s long-term observations of their experience, dedication and prowess as True Pilates instructors. These efforts were undertaken in order to offer you the highest quality instructor training program in the industry and to prepare you for a lifetime of teaching True Pilates. Romana’s Pilates instructor trainers will teach you much more than just the mat; every student must successfully pass performance assessments that cover all the key pieces of Pilates equipment! Romana’s Pilates Instructor Trainers can be found in 15 countries and 20 US states. Periodically we also have amazing teachers from all over the world coming to paradise to teach. Over the last 80 years, pilates has proven itself to be an effective method of exercise. It’s only recently that “Pilates” has gained in it’s popularity due to it’s amazing results. This method of exercise, orginally called, “Contrology” meaning the “Art of Control”, is now recognized and recommended by physical therapists, orthopedists, massage therapists and many more in the health care system. Joseph Pilates was a pioneer in understanding the depth of physical movement with perfection and gracefullness within that movement. Whether you are a couch potato, the accomplished athlete, or somewhere in between, come join us at Pilates in Paradise for a whole new world of movement. Your body and your mind will thank you for it. Over the past several years I broke a total of nine bones after a car accident and then a fall on the tennis court. Thanks to Christi and her excellent staff at Pilates in Paradise I have regained my strength and my confidence. Pilates in Paradise helped make me whole again in body, mind and soul. I stand taller and straighter, I dropped a pant size and gained muscle definition. Christi’s personalized instruction helped me achieve my goals to be healthier and to get back on the tennis courts…. pain free!! I highly recommend Pilates in Paradise for anyone who wants to change their physical fitness in a safe manner with professional, knowledgeable, energetic certified instructors. I am a winter resident of the Keys. 6 yrs. ago I came to Pilates in Paradise as a result of 2 major surgeries. Due to the good work of the staff at 72 yrs of age I’m able to be pain free & flexible.Thank You! View a quick expose on our facilities, our apparatus and our instructors. Feel free to ask us any question you may have about our classes, rates and events.